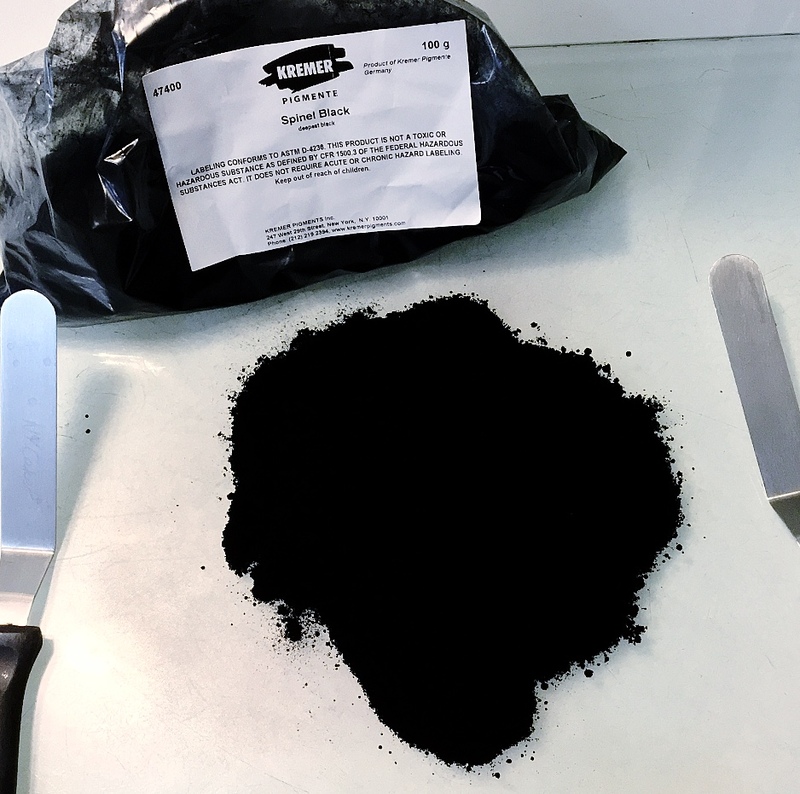 Spinel Black | Paint-Maker's Notes | Kremer Pigments Inc.
Spinel Black is often referred to as the only “true” black. 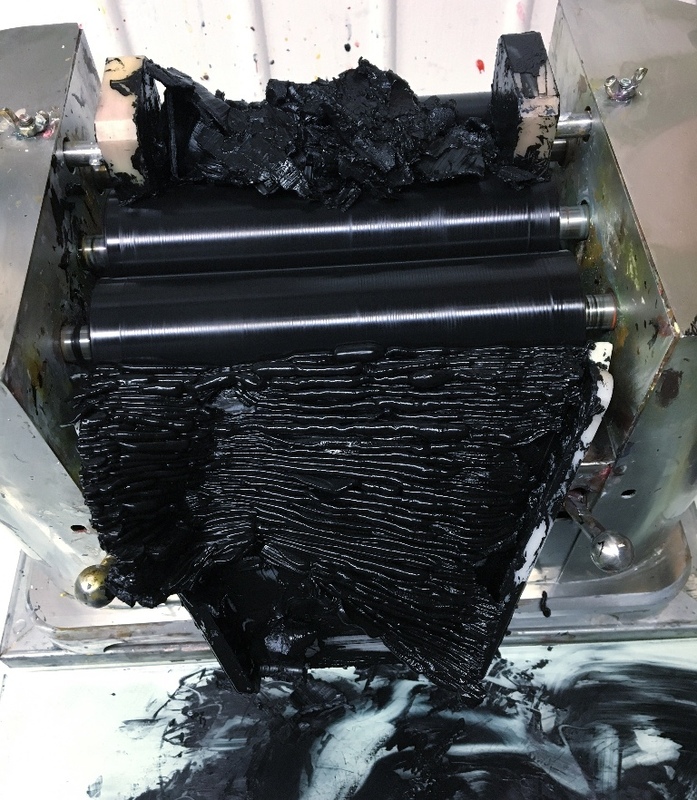 It is the deepest black pigment available unless you have access to a Vanta Black Processing facility. What makes Spinel so dark is its ability to absorb light evenly across the spectrum. Spinel Black is a thirsty pigment. The ratio of oil required to achieve a paint similar to the one shown here was around 65-70% by weight. For this particular batch we wanted a soft-body, high clarity, and faster drying oil paint, so I am working with Siccativated Walnut Oil (#73510). This particular pigment is incredibly fine (about a half micron), so a pinch will spread surprisingly far, which is a dream for those implementing glazing techniques, but a challenge for the paint maker - in our case a welcomed challenge. Whether mulling by hand or machine it is important not to add too much oil. After adding about 65 grams of Siccativated Walnut oil to my pigment the resulting paste still felt too dry. This is because the rate of oil absorption for this pigment is quite slow. If you already know the ratios of oil to pigment, it may be helpful to soak the pigment for a few hours before mulling it. Since I’m using a Siccativated oil, I prefer not to soak the pigment for more than 30 minutes before mulling, as siccatives increase the speed of oxidization which may cause the paint to stick to the wheels or the muller. Once ready to mull, I gather my slightly dry paste into a pile and cut off small one inch portions and mull them until smooth adding one or two drops of oil if it feels like my muller is not enough contact with the palette. If the paint is too thick the muller will not reach the glass and no friction will be possible. If running the paint through a three-roll mill, you may notice that the first few passes on the wheels will result in firm flat sheets that look like shaved chocolate. This is partly because of the fine particle size, and partly because of the slow rate at which the pigment absorbs oil. After 20 passes on the wheels or about 35 minutes of mulling by hand, the paste began to transform, taking on a more polished and shiny appearance. The body of the paint also became smooth and spreadable and ultimately yielded a lush, soft-bodied, deep black paint.